St Bloggie de Riviere: What happened to April? I've been getting to know the journey between Montpellier and Avignon in the last three weeks. My DB is now all moved and ship-shape in his new pad, and the next time I go, I'm expecting to have nothing to do with boxes, unpacking or hauling stuff to and from the garage. Phew! In other news, I'm looking very healthy thanks to some tanning capsules designed to help your skin cope with the sun. A healthy glow does wonders for morale, especially when you know it's been acquired just by popping pills. I've been wondering how much longer Pierrette can carry on. She's 71 now and not in the best of health. She told me she'll continue until either her clients have no need of her (unlikely), or she just can't carry on physically. I'm one of her oldest clients, along with 'la dame des impôts' who is not short of a bob and spends a fortune with her! In order to make room for the new stuff, I took the brave step of nearly emptying my wardrobe of all the clothes I haven't really ever worn. The two 100 litre bin bags contain several jackets. I never wear jackets with lapels and I have no idea why I kept buying them. My job doesn't require looking smart, and I don't find them comfy. They seem to swamp me. I have yet to actually remove the bags from the landing and take the definitive chucking out step, however... I'm sure that as soon as I do that, I'll need a jacket urgently, and in the exact red colour and style of the one I just gave away. Anguish. 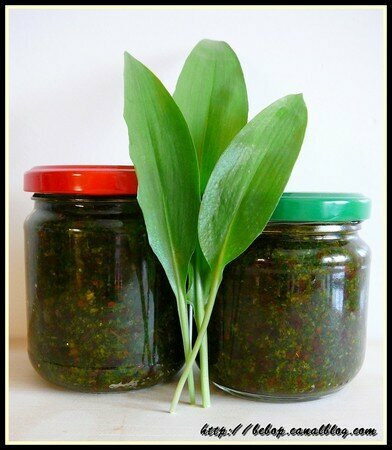 Finally, I bought some 'ail des ours' (wild garlic) from the 'Ruche qui dit Oui' the other week and, after searching on the internet, found a tasty pesto recipe that includes almonds and sun-dried tomatoes. We took a pot on a picnic on one of our recent walks (sneaked in between packing boxes), and very tasty it was too. There's quite a tang to it after the initial mise en bouche. My DB loved it so much that the next time it became available, he bought 4 bunches. This Friday (a holiday oh happy day! ), the St Bloggie pesto factory will be cranking out the stuff by the ton... Good thing I didn't throw out all the glass jars in my clothes clear-out too! I'm hoping all the dancing I'm doing at rehearsals will be good for my bones - there's a fair amount of leaping about! I'm told my natural hair colour is dark ash blonde a.k.a. mousey, but I colour it as it would be less mousey and more grey these days. :) My eyes are green/blue. Whizz the chopped tomatoes in a blender until finely ground. Set aside. Blend the wild garlic, almonds, salt and oil. Add the garlic mixture to the tomatoes and stir well. Put into jam jars and top with oil. Keep in the fridge. Clothes you can chuck...glass jars never!